A recent trip to New Orleans provided me the opportunity to bask in several facets of jazz. When possible, I took video footage to preserve a few choice moments. My first night in the Big Easy, I stopped in at the legendary Preservation Hall. With its intentionally rough-hewn interior, stepping inside was like visiting a living history farm. The Hall has been a tourist destination for half a century, but don’t let that keep you away. Sure, this may be the only live jazz most people will hear for the rest of the year, but that doesn’t mean it’s not worth experiencing. The setlist stuck to pre-war standards, but they were delivered with plenty of fun and energy. The venue’s name is apt. 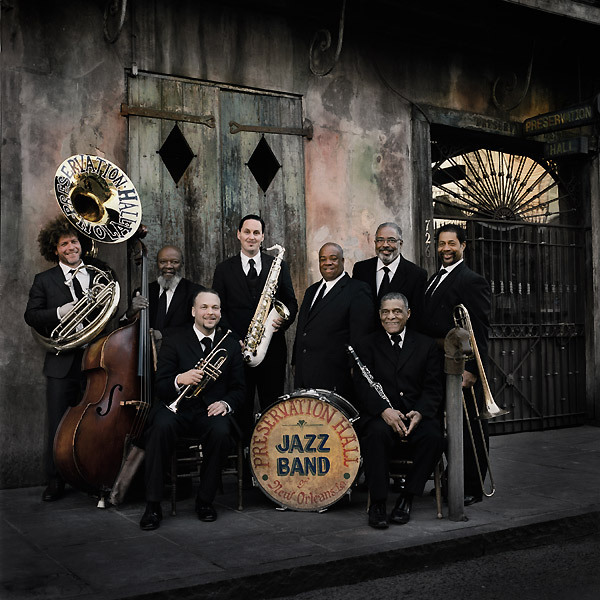 The arrangements aren’t groundbreaking, but the Preservation Hall band is keeping a sound alive that may otherwise have been forgotten. Unfortunately, no audio or video is allowed. Located on Bourbon Street a few blocks from Preservation Hall (and near Skully’s, a great record store), Fritzel’s European Jazz Pub draws on the same era, but from a different perspective. If Preservation Hall celebrates the Sidney Bechet of New Orleans, Fritzel’s commemorates the European Bechet. In fact, thanks to an audience request, the band leader treated the crowd to a great version of Bechet’s “Petite Fleur.” The 1959 hit isn’t the easiest song to master, but the clarinet player blew effortlessly. I was able to take a little video to capture the atmosphere in Fritzel’s. After two days in the French Quarter, I had had enough. The tourist trap may be fine for less-seasoned travelers, but I quickly discovered Frenchmen Street was where the locals partied, The corridor featured many fine clubs within the space of a few blocks, including Snug Harbor, the Apple Barrel and my destination for the next two nights, the Blue Nile and d.b.a. Kermit Ruffins has enough of a following that he can play nearly every night of the week. Locals now have to share Ruffins with tourists (like me) thanks to his appearances on “Treme.” The two-hour set was filled with standards like “What a Wonderful World” and “On the Sunny Side of the Street,” which Ruffins managed to freshen up without offending purists. An entertainer and trumpet player from the Satchmo school, Ruffins was determined to make everyone in room smile and get on their feet. The best moment arrived after an intermission, when the house PA’s version of Tupac’s “I Ain’t Mad At Ya” faded into a live version, with Ruffin’s delivering a blistering post-Katrina rhyme. Here is some footage I shot of Ruffin infusing the Black Eyed Peas with some much-needed zydeco. On my final night in NOLA, I returned to Frenchmen Street to witness Rebirth Brass Band at d.b.a. There are a myriad of great brass bands in the Crescent City, but Rebirth may be the only one that can boast a parental advisory rating in its catalog. The eight-piece unit mixes funk and hip hop into the traditional brass band sound. The stifling heat in the small room couldn’t keep the crowd from dancing, and the band seemed to be having the most fun. Here’s a bit of Rebirth’s tribute to another native son, Fats Domino.